Young Horse for Kirsty Ansell. Rocky (Avalonn-Visage) is full brother to Viva, Pinto, 16.1+ hands and born in 2005. In his relatively short time under saddle, this talented gelding has completed a few Intro events with Aaron Moyes in the saddle, as well as placed in showjumping classes at Gunnedah Showjumping Festival, Northside and SSJC. After a short period in training with Jamie Winning, the Ansells saw him competing in Canberra at the State Championships, and took him home to Queensland for their daughter Kirsty to continue with his training. 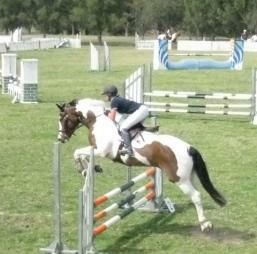 We look forward to seeinghim out onthe Young Horse circuit in the near future.